When we were young children, our grandfather would takes us to camp. As we sat cross-legged around the evening fire, he started his tale of our past. Slowly he poked the fire, sending embers floating into the sky. We waited for Grandfather to continue, restless on our colourful native blankets. He started again, telling one of my favorite stories: how we gained our family totem. The tale is based on our great-grandfather coming of age in the Black Hills of the Dakotas. 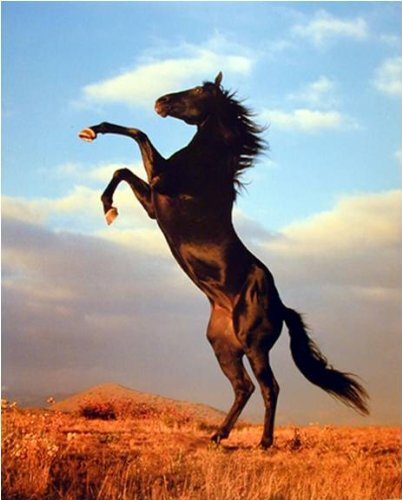 In the low rolling hills of the Dakotas, the Sioux sang of Howahkan, the wild black stallion. All of the Sioux nations desired this one black stallion for their herds of war ponies. Pausing again to allow us to settle, he went on. At the age of 15 years, James, our great-grandfather, fresh from Dublin, was out hunting for his family, accompanied by his loyal hound, Henry. James carried his trusty Winchester, tracking rabbits or grouse for dinner. The hunt was plentiful with two rabbits tied to his belt. Up ahead, a boxed canyon called him to explore. Moving quietly, he saw a herd of horses. Holding Henry from charging, he watched this small herd. In the center, a black mare and her new foal grazed. To the left her yearling stood watch, thumping the hard dirt. With Henry quieted, thoughts of capture raced though his mind. Bringing home a true prize, not rabbits but a horse. Oh, his family would be shocked and surprised. Grandfather stirred the fire again, and noticed his young charges had all fallen asleep. He stood facing north, giving a quiet chant and prayer to his, and our, totem. A small tear rolled down his weathered face. "Oh Howankan, you were a great horse, friend and companion." Howankan, our totem and guide, still watches over his family.